Another major crisis in Iraq has become a sound reason for raising the issue of a possible declaration of independence of the Kurdistan Region (KR). In the media one comes across petitions of support for Kurdish independence. More important, however, is not the question of whether and when the Kurds would announce independence, but the fact of the conscious building of their strategy in order to be able to declare this independence. In spring 2012 during the Kurdish holiday of Newroz there occurred a similar phenomenon of amplifying the theme of potential “declaring independence by Kurdistan.” Then the action was less spectacular. Taking advantage of another crisis in Iraq, the Kurds were able to move much higher in the level of public awareness. Kurdish leaders and many intellectuals realize that without the existence of Kurdistan in universal perception, the declaration of its independence may prove ineffective. The August 2014 exodus of Kurdish Yazidis, who were being attacked by the Islamic State, from the Nineveh Province (adjacent to the Kurdistan Region, and which encompasses a number of districts disputed between Baghdad and Hawler (Erbil)) may contribute to the creation of an independent Kurdistan in the future. Although the Kurdish Peshmerga forces failed in the first challenge against the Islamic State, it is not excluded that in the near future they might regain the sites occupied by the jihadists, and consequently would undoubtedly strengthen their position on the so-called disputed lands. The presence of this region in the media, despite the tragic circumstances, is in fact conducive to deepening the knowledge about Kurdistan. The division of forces that has taken place in Iraq after the fall of Saddam Hussein’s regime was particularly unfavorable for the Sunni, who, facing defeat, focused mainly on boycotting legitimate authority and organizing armed resistance. The Shiites, as the winners, have gone far in exposing their power (the authoritarian aspirations of former Prime Minister Nuri al-Maliki). President Jalal Talabani’s position was weakened due to illness. For many years he had been an effective force in reducing the severity of many conflicts. In contrast to the Sunni and the Shiite, the Kurds never belonged to either the frustrated or the winners. Although it was they who, together with the Shiites, created the draft of the new constitution adopted in 2005, and had every right to feel as co-creators of the new Iraq. This did not mean, however, that all their demands were met. The areas such as petroliferous Kirkuk, but also Sinjar and Sheihan, inhabited by the Kurdish Yazidis, remain under an unresolved dispute. The Article 140 of the Iraqi Constitution stating that a referendum is to be conducted in the disputed areas still has not been completed. The central authorities in Baghdad did not look too favorably at the very independent Kurdish economic policy regarding the sale of crude oil through Turkey (the pipeline leading to the port of Ceyhan on the Mediterranean Sea). The withholding of some part of Kurdistan’s budget is only one example of a repeated pressure exerted on Erbil. The Kurds also did not have a desire to take revenge on anyone, all the more since they, as a Sunni majority, have given shelter to many Sunni Arabs from the south. An additional issue which has changed the Kurds’ perception of the Iraqi affairs was the broader perspective of looking at Kurdish issues, not only through the prism of their own interests, but also the situation of their compatriots in neighbouring countries, such as Syria, Turkey and Iran. Many newcomers benefited from free access to education and other public services. Kurdistan’s authorities engaged in the Turkish negotiations with the Kurds living there, and also supported a part of the Kurdish opposition in Syria. The Kurds always repeated that they want to remain faithful to Iraq, under the condition that it will be a state respecting its own laws and citizens. The declaration still should not be considered as null and void, especially considering that the new president, an Iraqi Kurd, Fuad Massum, was re-elected. He is Talabani’s close collaborator and friend. Massum as both a specialist in Islamic philosophy and an experienced politician, is aware of factors that can unite people in Iraq. Paradoxically, actions towards stabilization of Iraq and the Kurdish aspirations for independence are not mutually exclusive. Firstly, both Iraq and Syria were established due to the secret agreement concluded between the British and French governments represented by Mark Sykes and Francois Picot George in May 1916. Under its provisions, the two countries shared their spheres of influence, which was not a democratic decision of the people living there. Therefore, the two countries will not necessarily be there forever in the Middle East. Secondly, it should not be expected that the decision of Kurdish authorities on its independence will be made hastily. It should be recalled that the President of the Kurdistan Region has only just announced a referendum on independence. It is rather another element of long-term strategy, which, as a result of recent events in Iraq, can be either slowed down or accelerated. an important symbol for the Kurds from neighboring countries, and Erbil has become a Mecca visited en masse by the Kurds from other parts of Kurdistan. Therefore, the chief objective of Erbil’s policy was the creation and development of appropriate political, economic, cultural and educational backing, which could become a solid platform not only for the dream of independence, but also for the very real everyday life. Throughout the years of fighting and setbacks the Kurds have learned that the idea of independence and heroism of people are not enough for its creation and development. Apart from the obvious need for economic base, which in the case of the Kurdistan Region in Iraq has been partially provided by the share of income from the sale of Iraqi oil and the cooperation with Turkey, there was also a need for access to new technologies, the intellectual development of citizens and skillful diplomacy. This process, strengthened after 2003 due to official recognition of the Kurdistan Region and having the opportunity to cooperate with the outside world, has gained in importance in recent years. As is evident from the interviews conducted through spring 2014 in Iraqi Kurdistan with representatives of cultural institutions, the dominant issue is the protection and development of Kurdish cultural heritage, understood as one of the important ideological factors for building an independent state, which vision is not limited at all to the Kurdistan Region in Iraq. As stressed by Newzad Ahmed, the head of one of the cultural centres in Sulaymaniyah: “Today in Kurdistan all agree that there is one goal, difference of opinion is the way in which you have to achieve it.” This is an important declaration of unity over divisions. This trend, despite many problems, can also be observed for a few years in the strategy of rival political parties and factions. The ability to maneuver between the two main forces of the region, i.e. Turkey and Iran can be considered skillful. While this maneuvering resulted largely from the distribution of political forces in the Kurdistan Region, between KDP with president Massoud Barzani (centered in Erbil), favoring rapprochement with Turkey and PUK and Goran parties (centered in Sulaymaniyah) traditionally sympathetic to Iran. However, thanks to this rivalry, both Turkey and Iran had to compete against each other for political and economic influence in Kurdistan, this, in turn, opened the way for the Kurds for a more demanding expectations. Since the beginning of the existence of new Iraqi, the Kurds also firmly declared that they would not declare independence without annexing Kirkuk. Most analysts linked it clearly with its numerous rich deposits of oil, which would give the Kurds the possibility of full independence from Iraq. We cannot forget, however, that Kirkuk has a symbolic meaning for the Kurds as one of the cradles of their culture. Taking advantage of the disintegration of the Iraqi army, in June 2014 Kurdish Peshmerga fighters took over the control over the city. Therefore, it was an important prerequisite for the declaration of independence for many, including Kurdish observers. In fact, however, the matter of the city’s belonging is not a foregone conclusion. The city council consisting of Kurds, Arabs, Turkmens and Assyrians, refrained from making any decisions (especially those relating to the production and sale of oil). The Arabs believe that the right to decide on this matter still belongs only to Baghdad authorities, while the Turkmens suggest the appointment of an interim council. Traditionally disagreements also apply to Kurdish KDP and PUK. The case is even more complicated considering that the Kurds cannot present all those concerned with a fait accompli, i.e. “Kirkuk annexation.” PUK does not agree with such a solution. From this party derives the current president of Iraq Fuad Massum. This solution is also not consistent with the image of a “democratic Kurdistan,” which especially in times of threat from the Islamic State, must rely on the help of the West. Therefore, the subject of Kirkuk’s belonging should not be considered at all closed. However, if the Kurdish Peshmerga forces prove to be saviours from the danger of the Baghdadi caliphate, they will have a stronger bargaining chip in talks with Baghdad, which eventually may lead to a referendum in accordance with Article 140 of the Constitution. Contacts with the Workers’ Party of Kurdistan (PKK), more precisely with its Syrian counterpart – the Democratic Unity Party (PYD) and its armed wing (YPG) is one of the failures of the Kurdish Region. These problems refer mostly to the party of Masoud Barzani – KDP. It is much easier for the pro-Iranian PUK to have a dialogue with this grouping. PYD bears the majority of responsibility for this state of affairs. Its exorbitant ambition to play a political role of the “one true Kurdish armed organization” does not allow them to look critically at their own activities. Still, in the event of such a serious threat like ISIS, both sides at least, should not create each other problems. The takeover by the Islamic State (ISIS) control over Mosul should have become a wake-up call for the Kurdistan Region authorities. Meanwhile, in early August surprised Peshmerga forces gave away a large part of the Nineveh Province in the hands of ISIS. Doubts start to appear, whether it was not possible to predict in advance the terrible fate of the Kurds-Yazidis and Assyrian Christians, to provide them with proper protection. Peshmerga fighters’ tardiness may become a difficult to heal wound in relations between the Kurds-Muslims and Kurds-Yazidis. While the Kurdish forces of PYD/YPG were happy to have benefited. Entering from the side of the Syrian side and attacking the Islamic State, they both ensured the protection to Yazidis and Lalesh – a Yazidi sanctuary in Shekhan (so just under the side of the existing bastion of KDP in Dohuk) and created a branch of the armed Yazidis, disappointed by the lack of help from the Peshmerga forces. In contrast to the propaganda of PYD, it should be said that support for the Yazidis Kurds came soon also from the Peshmerga forces. Many Muslim residents of Kurdistan took many of them in their homes, the KR authorities also offered financial assistance. In his statement President Barzani promised to punish all those who showed reluctance. 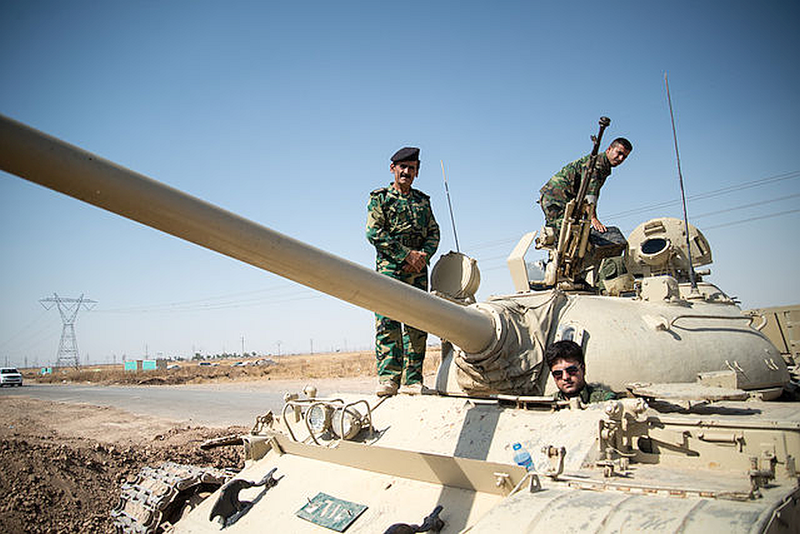 However, the “slowness” of Kurdish Peshmerga forces should be looked at the broader context. Firstly, the army for a long time has not fought on a larger scale (this cannot be said about YPG, which for many months have successfully defended Kurdish cantons in Syria against the pursuits of the Islamic State). Often due to conflicts with the central government in Baghdad, the soldiers were not paid on time. Ignored by many the Islamic State proved to be a well-armed force, trained and financed, and its goal is to conquer and fight in the name of Islam. It is the destruction based on the power of ideology. In contrast to the ISIS militia, many out of Peshmerga forces in recent years might have fallen for the weakening magic of prosperity and stability enjoyed by Kurdistan. Although the motivation to defend its borders is undoubtedly still strong, defeating ISIS may prove to be not so easy. Therefore, the initial submission could have been the voice of reason, the aim of which was to strengthen the positions, ensuring the safety of strategic places in KR. In addition, President Barzani’s call for support directed to the United States and the European Union could be motivated not only by fear of ISIS. First of all, the Kurdistan Region is facing a historic opportunity to strengthen its position in the region. If the campaign, led by the Kurds with the blessing of Europe and the US, is successful and provinces occupied by ISIS will be liberated thanks to the Peshmerga forces, this results in a much better position in future negotiations, and perhaps even lead to the recovery of most of the disputed lands. Increasing its military potential by the equipment sent from the West (which the Kurds in recent years has consistently been denied, taking Baghdad’s opinion into consideration here) is also quite a significant acquisition. It does not seem that the Kurds, as a result of the invasion of the Islamic State, were convinced about the “indispensability of Baghdad.” On the contrary, the Kurds once again found that in a crisis situation they cannot count on any assistance from Baghdad, and unanimously declared assistance from the West is the result of patient diplomacy led by the KR authorities in recent years. However, the relations with YPG (PYD) associated with PKK still remain a problem. In fact, if PYD and Peshmerga forces united their efforts, perhaps Western aid would not be so necessary. President Masoud Barzani made the first step in this direction by unexpectedly visiting partisans of YPG in Machmur, where the fights went on. PYD/PKK, marginalized by Turkey and the West, is a force that could be useful in fighting against the Islamic State. This is evidenced by the fact already mentioned above, the effective protection afforded to the Kurdish cantons in Syria. Expanded ambition and panache of this organization are caused by isolation from the West, which, paying heed to Turkey, does not want to talk to “terrorists.” However, in the situation when Turkey is also responsible for the strength of the Islamic State in Syria, permitting through its territory anyone who wanted to fight against troops loyal to President Assad for many months, perhaps one should be slightly less sensitive to the Turkey’s malaise. The situation where the Peshmerga forces are supported while PYD/YPG/PKK, which sheds blood for months in the fight against the Islamic State, is marginalized, will not serve not only the Kurds, but above all an effective campaign against ISIS, which should now be a priority in international policy towards Iraq. The perspective of the creation of an independent Kurdistan should still be treated with great attention, because the topic has long gone beyond the realm of the Kurdish dream and become a reality picking the colors. With Syria engulfed in civil war and Iraq plunging into the chaos, the Kurdish independence project is one of the clear visions that does not stop at “freedom from,” but is consistently building “freedom to.” Even the most critical observer must now admit that both in Syria and Iraq the Kurdish idea of happiness has much more in common with democracy understood as the “government of the people,” rather than a number of projects of their nearest neighbours, in particular the creators and supporters of the Islamic State. Therefore, despite the reluctance to violate any geopolitical status quo, both America and Europe should open up to this new opportunity, and not to require from the Kurds to be an eternal bond that connects incoherent state formations. Perhaps it is the creation of an independent Kurdistan that would be the best element in order to stabilize a region so embroiled in chaos. Revision of the policy towards the Kurds, of those who for years have been Western allies (such as the Kurdistan Region authorities) and those considered as “terrorists” (PYD/PKK). Increasing attention and commitment to the problems of Kurdistan (both the Kurdistan Region in Iraq as well as for its other parts in Syria, Turkey and Iran). Recognition of the possibility of an independent Kurdistan as one of the possible scenarios of events in Syria and Iraq.